I have to say I have been rocking with my diet lately – I am so proud of myself. I really feel as though the Whole 30 has changed my life! I seriously have NO cravings whatsoever for anything other than REAL food! I have been more motivated than ever to cook and eat real food, it’s awesome. I have become much more creative using my leftovers then I ever knew I could be. 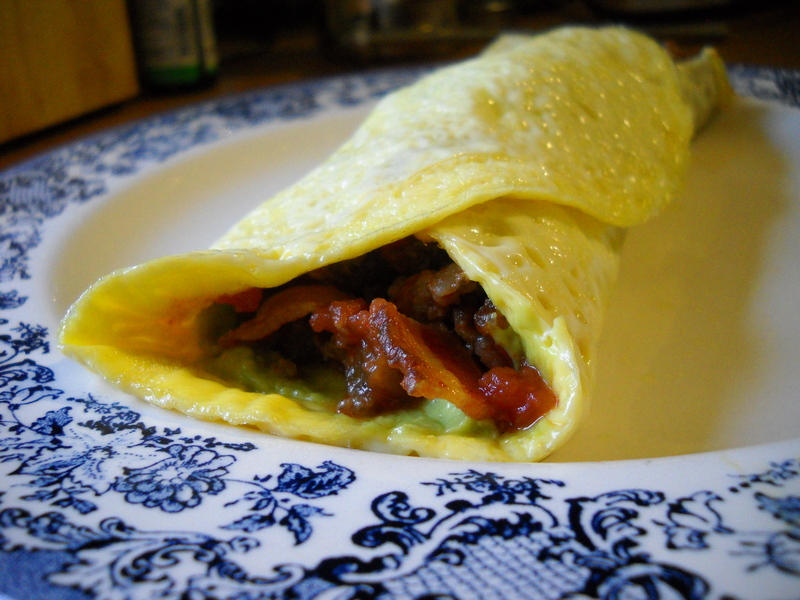 This Breakfast Burrito is the perfect example. Although I would like to take credit for the original idea, I can’t. I saw it somewhere else, I just can’t remember where (the danger of owning 5 paleo cookbooks, and subscribing to too many paleo blogs). First, it started because I was baking some bacon in the oven to have with some chard later on in the day. I decided I would steal a couple of pieces for my breakfast. The “tortilla” – I just beat 2 free range eggs with about 1-2 tbsp of water until it was light and fluffy and poured it into a heated skillet that was slightly oiled with EVOO. I cooked it with the lid on until it looked like a nice flat tortilla. I didn’t even need to flip it. It slid right out of the pan onto a plate. cooked grassfed ground beef sauteed with onion and some red pepper with chili powder, black pepper and garlic and a bit of cumin. Once the filling was heated I spread some (about 1tbsp) homemade guacamole (basically avocado, lemon juice and garlic) on the tortilla, put my filling on, and dabbed 2-3 tsp of salsa on top and rolled it up nice! The end result was seriously yummy!